So finally the final piece i need for my hardware upgrade arrived, the OptiBay. 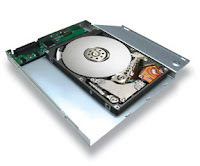 It is basically an adapter that allows you to replace your MacBooks SuperDrive with a second harddisk. The installation is "quite" easy and done in a few minutes. My little 13'' machine now features 620GB Storage, a Intel X-25M 120GB SSD and a 500GB 7200rpm Seagate Momentus. Next post will be in depth look at the software update, dropbox home folder syncing and a little glimpse at iCloud. That's a lot of storage space for a lot of mischief! I always wonder why people need two hard disks for their internal stuff (OS, apps, settings, etc). I'd much rather use it for other things, so as to not spread my applications all over the place. How small is yours? I'm curious. Hope to get one too, when the prices are down a bit more. They're seriously worth the money though. This is a pretty useful tip! looking forward to your post on iCloud, I never trusted cloud computing myself.